The UNO is a simple, affordable and robust inflatable de-power trainer. With a unique design incorporating only one strut it is an ideal kitesurf trainer for schools, operating and functioning the same as larger inflatable water kites. It is also perfect for any kiter to have as a fun addition to his/her quiver to get family and friends into kiting. 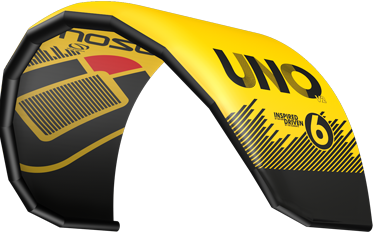 The Uno is great for teaching because the student can learn how to use the safety systems and how to re-launch with ease, using the same bar system as on the larger Ozone water kites. Schools can now teach students in high winds in the water, without having to sacrifice functionality of an inflatable kite. It can also be used for first lessons on land. Being a lightweight package it is easy to travel with and keep in the car. 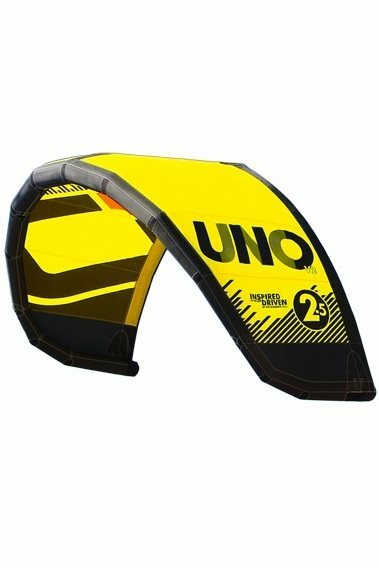 This UNO 4m surprised us with its performance. One of the best stability, good power for a 4m kite and real easy in handling. Always feedback and pressure on the kite, even on the edge of the wind window. This UNO is more than a trainer, it generates enough power from 14 knots to try the first water starts or for kids to play around. The bar release safety is great, short de-power stroke and easy sheet & go power control. Overall a very good kite for kids! Easy set-up, easy handling and great safety. On our blog more info about kids kite reviews.